William Hill is one of the most well-known gambling brands in the UK. 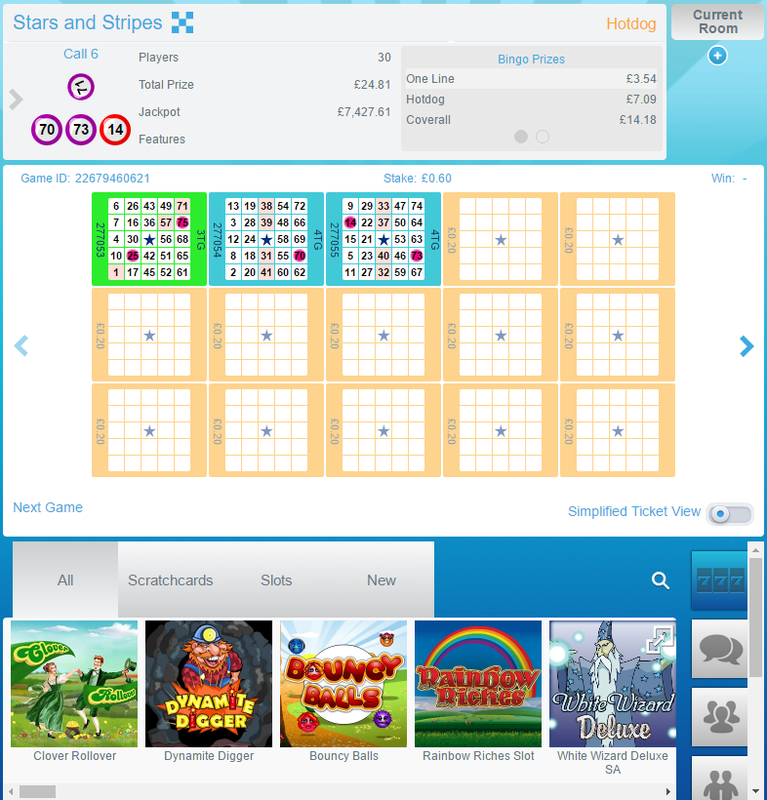 The William Hill bingo website is highly popular thanks to the wide variety of games available. New players get a great bonus whilst regular players can enjoy a range of exciting promotions. There is a huge choice of games and some of them are even themed – one theme is the popular TV show Deal or No Deal. 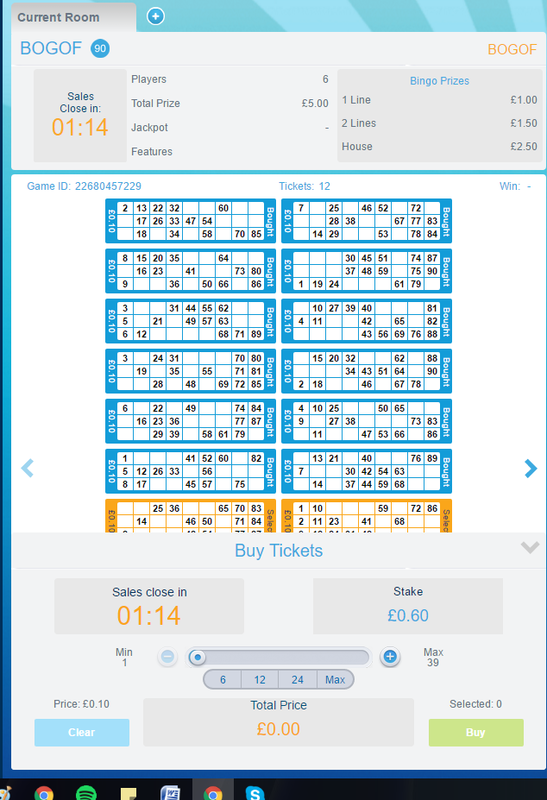 There are also lots of extra incentives for playing William Hill bingo including chat games and loyalty points. There are daily and weekly promotions and even BOGOF games where you can get free tickets. 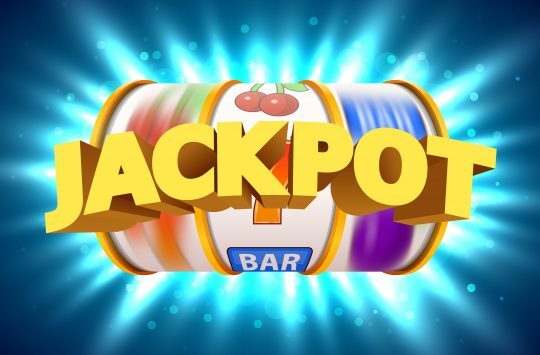 As well as bingo, there is several casino games available such as scratchcards and arcade games which compliment your bingo playing experience, meaning that you can maximise your potential earnings without even leaving the bingo website. William Hill Bingo’s customer service team is constantly working behind the scenes to make bingo playing a great experience. 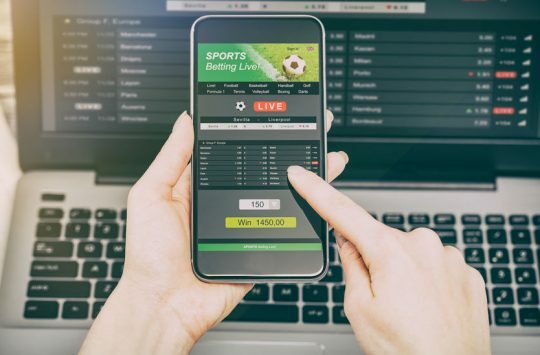 They host chat games in the chat room (where you can talk to fellow players using ‘bingo lingo’) and use the latest technology to ensure your gameplay runs smoothly. Your information is kept completely secure and convenient payment methods for banking are provided. When you sign up as a new player at William Hill Bingo, you will get a £40 bonus if you spend £10 in the first seven days. That means that you don’t get a bingo bonus as soon as you sign up, but the minimum deposit is £10 – so if you spend all of that £10 in the first seven days, you will get a £40 bonus to enjoy. The bonus is split into a £30 bingo bonus and a £10 bonus for the slot games. New players also get exclusive access to a newbies room – known as the Arrivals Lounge. New players can access the lounge for eight days after they have opened an account – there is prize money of £3,200 to be won. However, the room is only open at certain times: 10am-11am, 4pm-5pm and 7pm-8pm each day. Roll-on Mondays: Between 7pm-11pm on Mondays, there are more chances to win as the game keeps going even after the first full house has been called. Four hours of free bingo: 11am-midday, 2pm-3pm, 5pm-6pm and 10.30pm-11.30pm on Mondays is free bingo time! Win up to £15 for free. £50k cash cubes giveaway: Play cash cubes for the chance to win £50,000 – you have to collect 50 cubes of the same colour. Friday 16th December – £25,000 prize in the Deal or no Deal room. In the 75 ball Diamond Room, you can play free bingo each day. There are four free games between 11am-12pm. You can only buy up to 12 tickets and you can win up to £30. Free bingo is only available to members. It’s really simple to sign up to William Hill bingo and begin playing. Click the join now button and you’ll be taken to a two-step registration form. You’ll be asked for information such as your name, email address, and address. 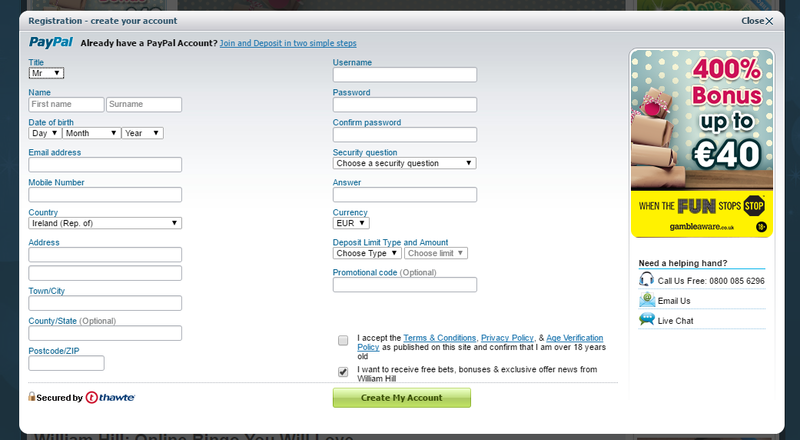 You’ll be asked to create a username and password, choose how much you want to deposit and you’re good to go! You will need to make a deposit before you can play any of the games. To play, just choose a room, purchase your tickets and wait for the next game to start. 90 ball bingo is the most popular type of online bingo as it gives you three chances to win. The first prize is awarded for a line, and then two lines and eventually, a full house. William Hill has a wide variety of 90 ball games including BOGOF (free tickets), Bargain Basement (never costs more than 5p a ticket), speed bingo (the numbers are called quickly), Deal or No Deal bingo (get a call from the banker if you win and you decide whether to take the money or keep the contents of your own box) and Late Lounge (starts after midnight each night). 75 ball bingo is more popular in the USA. The numbers are listed in a BINGO system and you have to make a pattern to win – usually double lines or a cross. 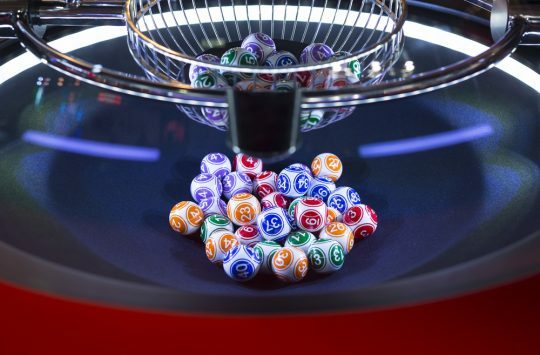 At William Hill, there are several 75 ball games including Stars & Stripes (named because of 75 ball’s popularity in the US), Deal or no Deal 75 ball jackpot (progressive jackpot) and the Time Out Tavern (90, 75 and 80 ball games). 80 ball bingo is traditionally played in bingo clubs between games. You can play for lines, corners or a full house. 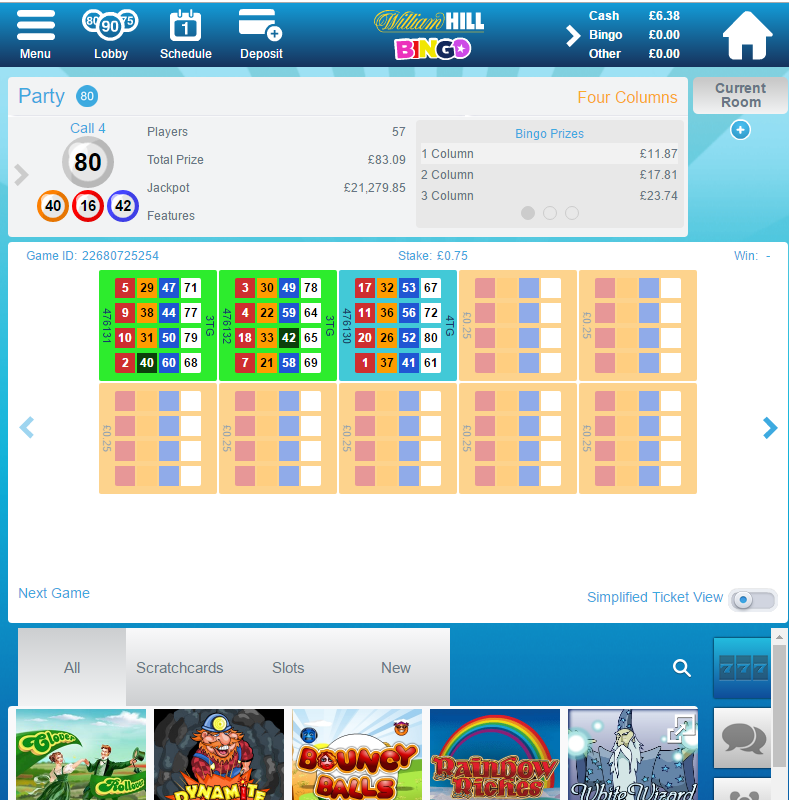 At William Hill Bingo, 80 ball bingo is available in the Party Room and in the Variety room. You can win between £5-15 in the party room. 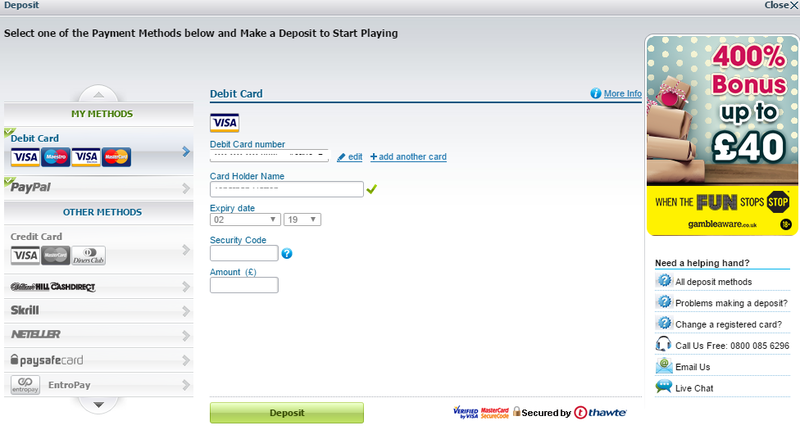 It’s really easy to make a deposit at William Hill. You just click deposit at the top of the screen and it opens the above window. The information from the card that you used to make your first deposit will be stored already, or you can use Paypal or a different card to make your deposit. To make a withdrawal, go to your account, click withdrawal and select the amount that you would like to withdraw. If you get tired of playing William Hill bingo, you can play slot games. You can choose from arcade games, number games or scratchcards. Each game is themed with different characters to make them fun to play. The stakes for a spin are low i.e. 10p but be careful as they can automatically be set to the maximum amount so that you overspend. You can contact William Hill Bingo by calling 0800 121 66 88. You can contact William Hill bingo via email by filling in the online contact form. We think William Hill Bingo is a good site. There is plenty of variety in the game themes and three different types of bingo to enjoy. The ticket prices and prizes are varied and we liked to have the option of speed playing. You can get the bingo on your mobile phone, and the website is really user-friendly and it’s easy to find the game that you’re looking for. Wide variety of games available.